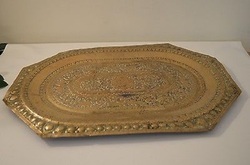 We have a wide range of Brass Serving Tray, Our brass trays are available in different designs and shapes and can do various types of finish. With a firm commitment to quality, our organization is engaged in offering a wide ambit of Serving Tray. We are offering to our valued customers a fine range of Brass Serving Tray. These are round brink and the base is bordered with enticing floral designs. The wavy edge and patterned linings on their outer surface, our trays & bowls are widely used for various occasions as these make the food look more delicious and tempting. We are one of the leading entities of this domain, engaged in offering Brass Serving Tray. With immense market knowledge, we have been able to provide optimum quality Brass Handled Serving Tray. Brass Square Tray with round edges. Can also be modified in Aluminium. 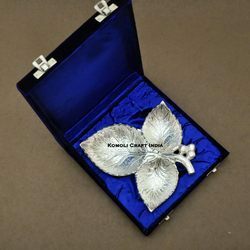 We are one of the leading manufacturers of superior quality brass serving trays that are widely sought after for their exquisite make, designs and artistry. These have been crafted using the choicest brass & bronze that reflects in its quality.